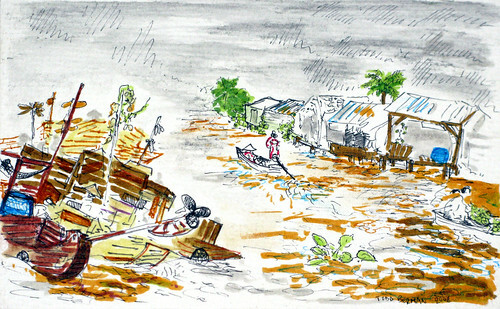 The Mekong is drowning. Dam, our guide from Sinhbalo Adventure Travels tells us that in 50 years, most of the land around the Mekong – as well as the sprawling, densely populated city of Saigon – will flood as ocean levels rise due to global warming. Todd and I don’t find this surprising since, during the last three days we’ve spent with Michael and Judith, our only companions on our small-group tour, we’ve been biking through flooded, muddied streets. Children splash out of their small houses along the bumpy country road to scream “Hello! !” and wave, a movement that becomes a spastic motion that carries down from their fingertips to shake their entire body. I name these kids “The Ambassadors of Hello.” Shacks built on stilts along the Mekong’s shores hover precariously close over the river’s surface, their thin wooden floors so warped by damp and time that the river-facing edge laps the water like a thirsty cat. In Can Tho, a combination of the rain-swollen river and a near-full moon causes the city’s street drains to suddenly run in reverse, bringing the Mekong’s water into the roads. Residents pull their motos onto the sidewalks above the floodline, leaving pedestrians to ford the sometimes two-foot deep flooded streets. As we slosh our way through the dark streets to get dinner with Michael and Judith, shoes in hand, we ask ourselves “Was it worms or something worse that the guidebook says you can catch from touching the Mekong’s waters?” As we fret, we pass by local kids swimming in the deeper parts of the streets while tuk tuks and motos drive by, the drivers sensibly having tucked their feet on top of their handlebars to keep dry.